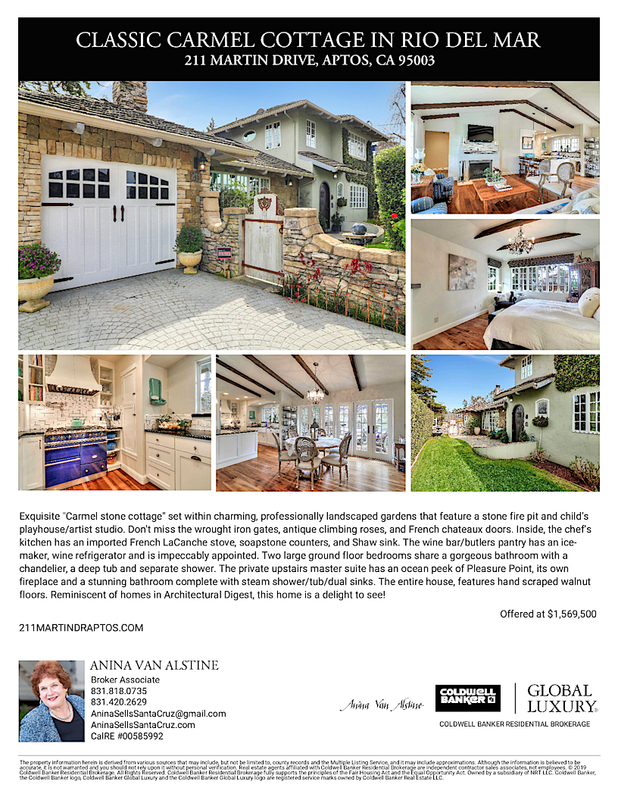 Absolutely exquisite "Carmel stone cottage" set within charming, professionally landscaped gardens that feature a stone fire pit and child's playhouse/artist studio. Don't miss the wrought iron gates, antique climbing roses, and French chateaux doors. 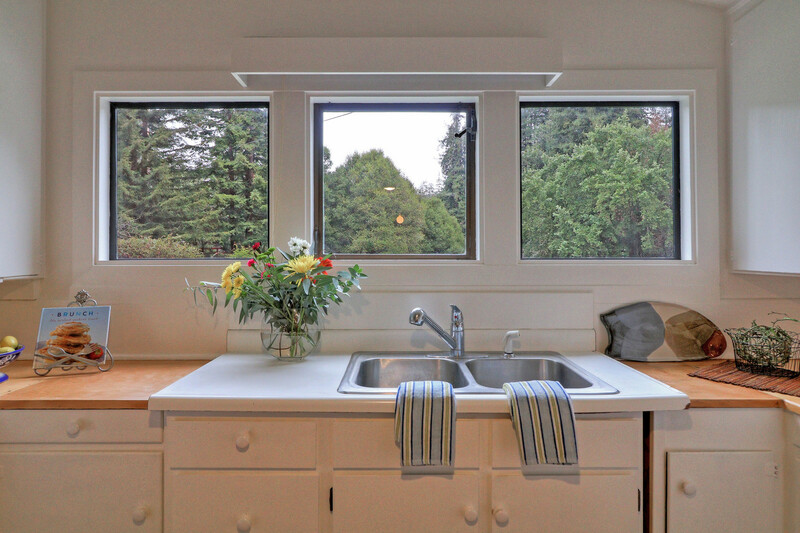 Inside, the chef's kitchen has an imported french LaCanche stove, soapstone counters, and Shaw sink. The wine bar/butlers pantry has an ice-maker, wine refrigerator and is impeccably appointed. Two large ground floor bedrooms share a gorgeous chandeliered bathroom with a deep tub and separate shower. The private upstairs master suite has an ocean peek of Pleasure Point, its own fireplace and a stunning bathroom complete with steam shower/tub/dual sinks. The entire house, including the media room, features hand scraped walnut floors. Reminiscent of homes in Architectural Digest, this home is a delight to see! 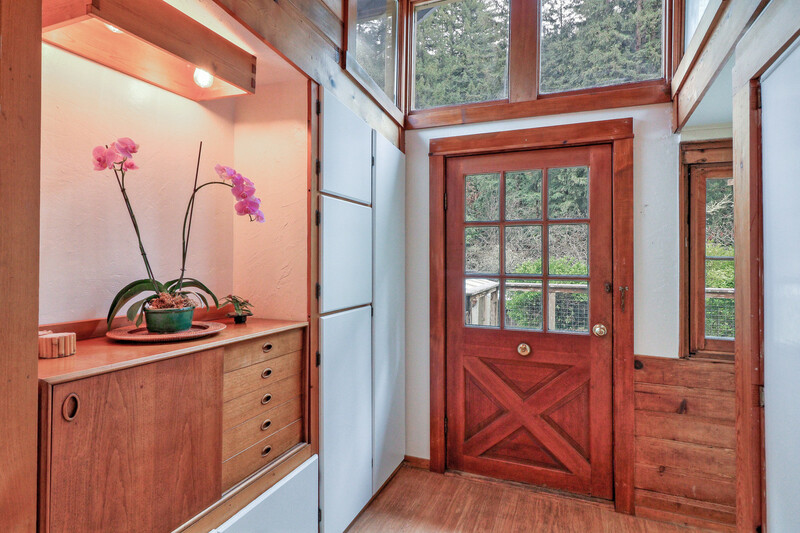 Vintage home on a 2.5+ acre parcel near Soquel Village and "The Land of the Medicine Buddha". Foundation installed in 1990; new well as of December 2018. Fruit trees, raised beds, workshop and carport with storage building. Local architect has indicated an ADU may be possible. 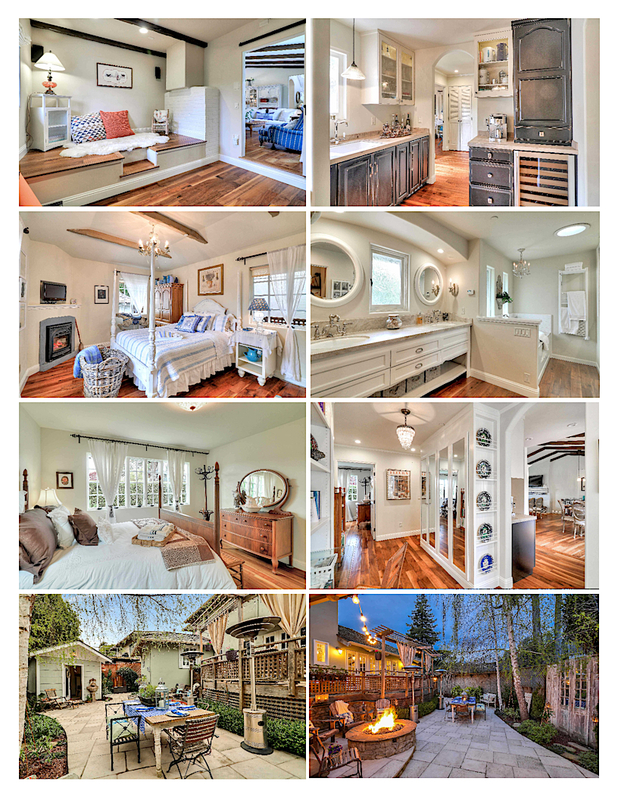 Near Main Street Elementary and 2 miles to Capitola Beach and Village. 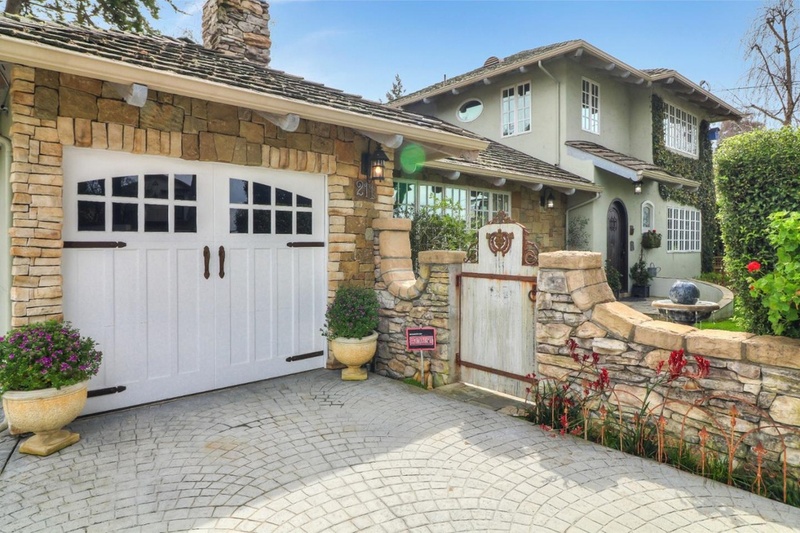 Great location for commute to Old San Jose Road. 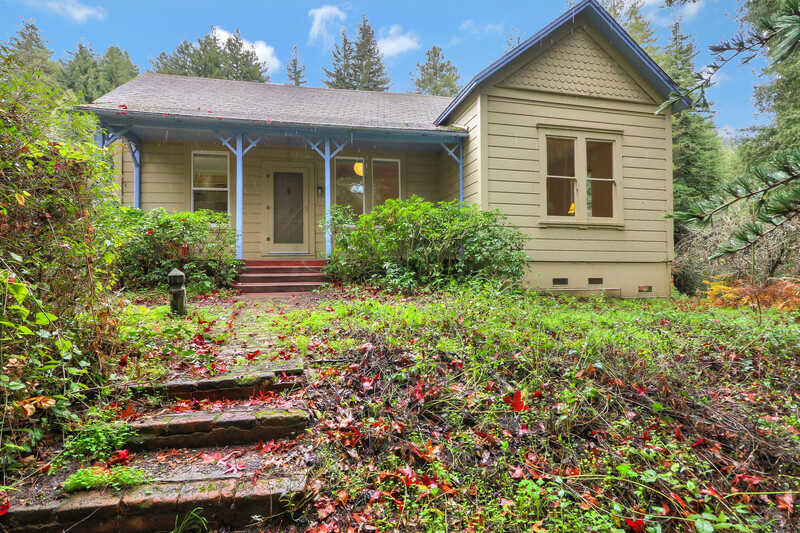 4150 Glen Haven Road, Soquel - Historic Site! 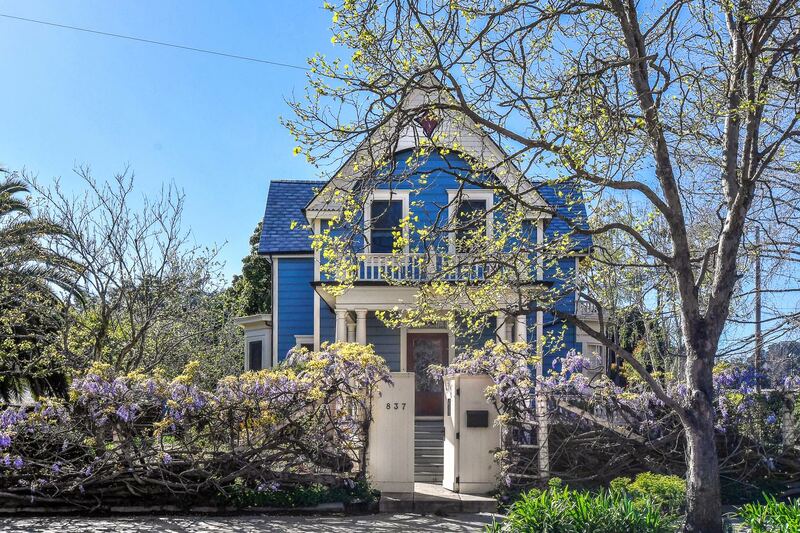 Classic Victorian home on 13,500+ square foot lot! 4 BR 2.5 baths. Deep porches with room for you to set your swing! Formal Dining room and entry hall with original metal fireplace converted to wood from coal burning. Formal Living room with rounded bay and views of the garden. Modern kitchen with retro stove and refrigerator and Miele dishwasher. Large breakfast nook opens out to the garden. Original redwood floors. Wine Cellar. Spacious Master bath with heated floors, deep soaking tub, and separate shower. Vintage fruit trees, outside patio. Potting shed. Exquisite plantings, including lush Rhododendrons. Tesla charger! This treasure is just a short distance to downtown and shopping, restaurants and movie theaters. Santa Cruz is a great bicycle city; West Cliff Drive and beaches are just s short ride away. 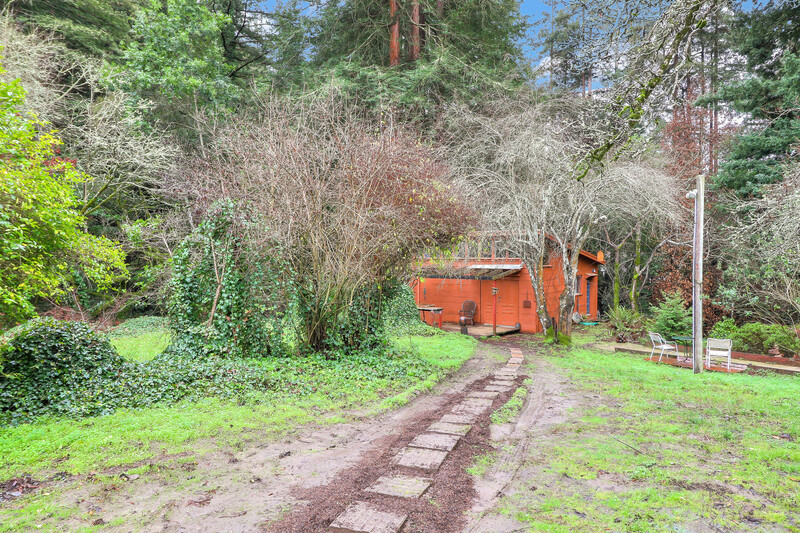 Near Busline to UCSC and easy access for commuters.This property sold over asking! My clients always get the highest possible price when they sell. If you are thinking of selling, please contact me at 831-818-0735. I have 40 years of practice as a Real Estate Broker in Santa Cruz. I am passionate about obtaining the best results for my clients. Many of my clients refer their friends and relatives. I always achieve the best results possible in any market. The market is always changing; I keep my clients informed as to their best strategy for the current market. Whether you are a Buyer or a Seller I can help you obtain the best possible outcome. If we work together I will be there for you 100% of the way, both before, during and after the transaction. "Anina is the Best. Stop looking because she's got it! So attentive and knowledgeable in every area of selling and buying a home. She sold our condo in no time! No stress, no hassle, no worry. All professional and kind and forward thinking. No hiccups, no mistakes, and we even gained a new friend! She's perfect for every situation!" -Stephen O. and Nicole P.
Trained by Lorna Hines sales career resources as a "Certified Negotiator". A trusted resource for answers about all steps of the buying and selling process. Familiar with Propositions 58 and 60. I know which criteria will enable a person over 55 to take their property tax base with them. Experienced with conventional, Reverse, VA and FHA financing as well as how to create "owner financing" and can execute all the necessary paperwork for that eventuality. Familiar with installment sales and they can sometimes benefit a seller. Many factors affect the value of a home for different buyers. I can help you to present your home in the best light to help obtain the highest possible price! I use innovative marketing strategies on all media. Although the internet is a valuable marketing tool I also advertise in the local print media, mail out postcards to clients and the neighbors, and hold extensive open houses, including a catered broker's tour for all of my listings! My expertise about neighborhood features and benefits helps to enhance my sellers' ability to obtain the highest possible price! My experience in design and construction enables me to help my seller clients with their decisions about improving their home prior to market. NEGOTIATION is my strength and why clients seek me out. My clients know they have not left one dollar on the table. I can help you determine which neighborhoods provide the qualities you need. From community to climate to commute, we will find the best location for you! You will become an expert in the benefits of each neighborhood and together, we can find the best house for the best price in your desired area. I am connected to local experts in the trades. I can refer you to the appropriate parties, from termite and property inspectors to well drillers, land use planners and other experts. We consult about which repairs are relatively affordable and which can be prohibitively expensive. My awareness of the market and negotiation skills help my buyer clients obtain the best property for their needs at the best possible price. I speak French fluently. Je parle Français courament et je peut vous aider a vendre ou acheter une maison içi ou en France! "Because of your strategic planning on the timing of our sale, the presentation of our home and most importantly your optimal negotiating skills and counter offer strategy, we sold our home for over 32% our asking price-significantly above the target we had set. We're grateful you took the leap to Palo Alto and coached us through the sale of our home. Your brilliant strategy has sent us on our way to our dream life by the beach in Santa Cruz. We would gladly recommend your services to anyone who either wants to buy or sell a home in the Bay Area." "Anina is an extraordinary proactive agent. She did such an outstanding job as our agent for the purchase of our first home in Santa Cruz, we asked her to help us buy our second existing home in Santa Cruz, sell the first home in Santa Cruz and one in San Carlos! Anina has the experience to provide a balanced, long-term outlook and is always available to answer questions and discuss alternative approaches that get the job done." "I have had only positive experiences with Anina both in working with her as a mortgage banker and having her represent me in the sale of my condo in 2013. I founded Network Mortgage in 1998 and was in lending for 25 years. I got to see many realtors and how they operated and Anina always stood out as a total professional. Anina works both hard AND smart, so when it came time for me to list my condo the choice was easy. My unit sold quickly and for over $40,000 more than the last sale in the complex! When my husband and I get to buy back into the Santa Cruz market in 2015, Anina will be right there to represent us. Do yourself a favor and when you interview agents, give Anina a call. You'll be as impressed as I am." 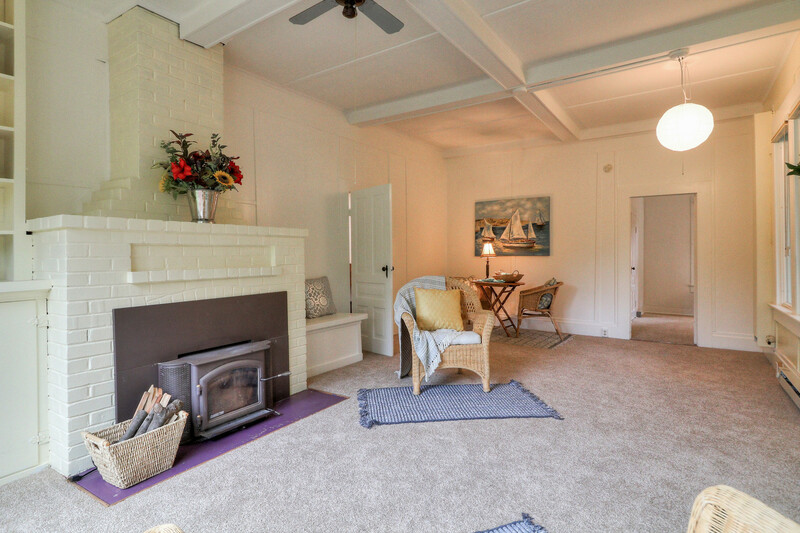 "Anina has been our buyer's agent for two homes in Santa Cruz County in the last 3 years. She has an encyclopedic knowledge of the area, neighborhoods, inventory, the seller's agents, and resources (inspectors, lenders, contractors, cleaners, etc). She has tremendous energy and wouldn't slow down until we had the right house at the right price and terms, including tough negotiations. Anina has strong opinions about what she considers a good home, but took the time to understand what we liked, and then unemotionally guide us to make the right choices." "When I decided to move from Palo Alto to Santa Cruz, I was referred to Anina van Alstine. We had a very thorough telephone interview, and then on the day I could come over the hill to look at houses, she had an open house. So she organized a self-driving tour of houses which met my criteria. On the day I could come look at houses, I got stuck in traffic and was over an hour late in making my appointment, but she was still waiting! She had listened so carefully and had asked the right questions, so the first house she showed me was perfect. Closing and all were smooth. I bought it and have lived there happily ever after. But, I have continued to rely on Anina and her knowledge of the neighborhood, of service providers and general savvy; she is skilled in negotiating and hardworking. She is THE expert on Santa Cruz; I would recommend her to anyone who is interested in buying or selling property in or around Santa Cruz." © 2019 MLSListings Inc. All rights reserved. Updated Apr 22, 2019 3:39:pm. Information deemed to be reliable but not guaranteed. The data relating to real estate for sale on this website comes in part from the Internet Data Exchange Program of the MLSListingsTM MLS.